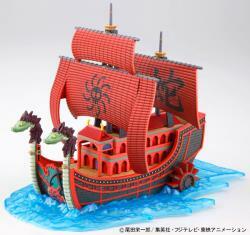 Kuja Pirate Ship from One Piece joins the Grand Ship Collection, an affordable and fun collection line! The Kuja Pirates are led by fan-favorite Boa Hancock! "Toy Panic FTW~ thank you so much helping me to bring in my 1st statue. Great packing and quick reply as always whenever I need any inquiries to Toy Panic through e-mail. Keep up the good job! :)"